Barnacle Goose Paperworks: January, month of fires and floods. And a snake alert. January, month of fires and floods. And a snake alert. Two weeks ago we watched in horror as Victoria and southern NSW were engulfed in fire. Today dreadful floods engulf Queensland and northern NSW. Our Prime Minister, Julia Gillard, is today visiting Victoria where fires are still burning, and at the same time she is explaining measures the government is taking to support those losing their homes and businesses in the floods. Between the fires and the floods hundreds of houses, many thousands of hectares of forest and pasture lands, possibly millions of animals, both farm stock and native wildlife, have been lost. Eucalypt shedding bark, providing fire fuel but looking really beautiful. Stunning colours. During the extreme heat it was impossible to be unaware of the fire danger. 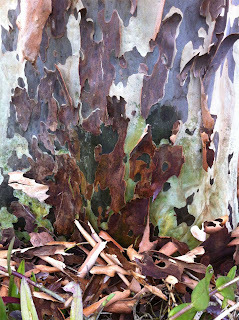 Living surrounded by bushland, with huge eucalypts towering over our house, makes me uneasy. I wouldn't live without them, of course, because they are so beautiful, but I did find myself checking my NSW Rural Fire Brigade app "Fires near Me"quite often. Not only for my own area but those of my family and friends. We didn't have a fire, but temperatures of 46C/114F have scorched the garden and it all looks rather sad right now. 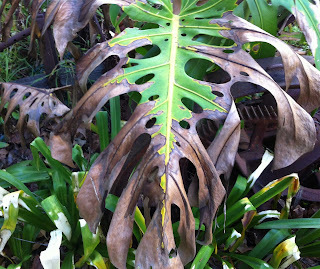 Monstera, Agapanthus, native ferns, Begonias, all burnt. Even plants in the shade were singed, the air was so hot. As if that wasn't bad enough, the orchard was attacked by the Red Shouldered Leaf Beetle (Monolepta australis) and in a very short space of time they skeletonised all the new leaves on the stone fruit. This was a new pest to our garden and we weren't impressed. Tiny yellow beetles swarmed over us when we moved in close enough to look. Yesterday the rain moved down the east coast of Australia and is giving us a generous drenching. This coastal region is quite swampy (read mosquito ridden) and enough rain causes local flooding. We should be okay, but the university campus grounds will probably go under. A dragonfly has taken refuge on my screen door, safe from the rain. Wing span of 12cm. I generally welcome the visitors, including this little Krefft's Dwarf Snake. We often fish them out of the swimming pool but this fellow was just curled up in the sun. Snakes are protected in Australia so we put them in the bush with admonitions to stay put. The adult Krefft's Dwarf is small, only about 30cm/12", as this one was, and although venomous, will not strike, even when provoked. I'm not sure who provokes a snake deliberately, but I'm quite pleased to know that this little snake isn't interested in biting anything other than a food source, such as lizards. I know snakes creep some people out but trust me, this one is a sweetheart. The children were blessed with a little dog at Christmas time. The two younger kids were very nervous with dogs so this was quite a lot for them to cope with but after a couple of days they fell in love with her and she with them. Her name is Peggy and she's a Jack Russell, very fast and absolutely so busy looking for ... anything that moves, really. Our concern is that she will nose out a dangerous snake, like a Brown, and that could be terrible, but hopefully all her snuffling and digging may make the snakes move elsewhere. Fingers crossed. 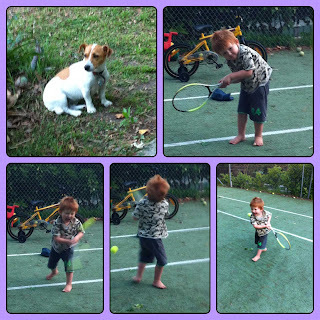 So here is Peggy, and Eddie on the tennis court. The children are learning ball skills. And whacking skills. 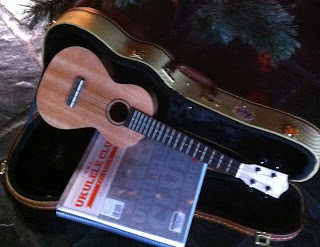 I have a tenor ukelele - a Christmas present from my girls. Now I need to learn to play it... I have a few apps that explain chords etc., but I suspect I need Ukelele for Dummies, which I think also comes as an app. There are Uke groups all over the place, obviously a very popular instrument. My parents could play guitar, banjo, mandolin and ukelele. Why did none of that talent rub off on me? Perhaps it did - I won't know until I try, will I? Now, I seem to have turned my blog into a personal stream of consciousness, with illustrations. Not really what my plan is for this blog. In future I'll try to get back to creating - whether books, art or rusty stuff. 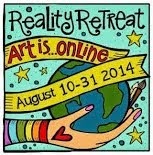 I'll leave you with a link to Seth Apter's fantastic Art Blog Directory. 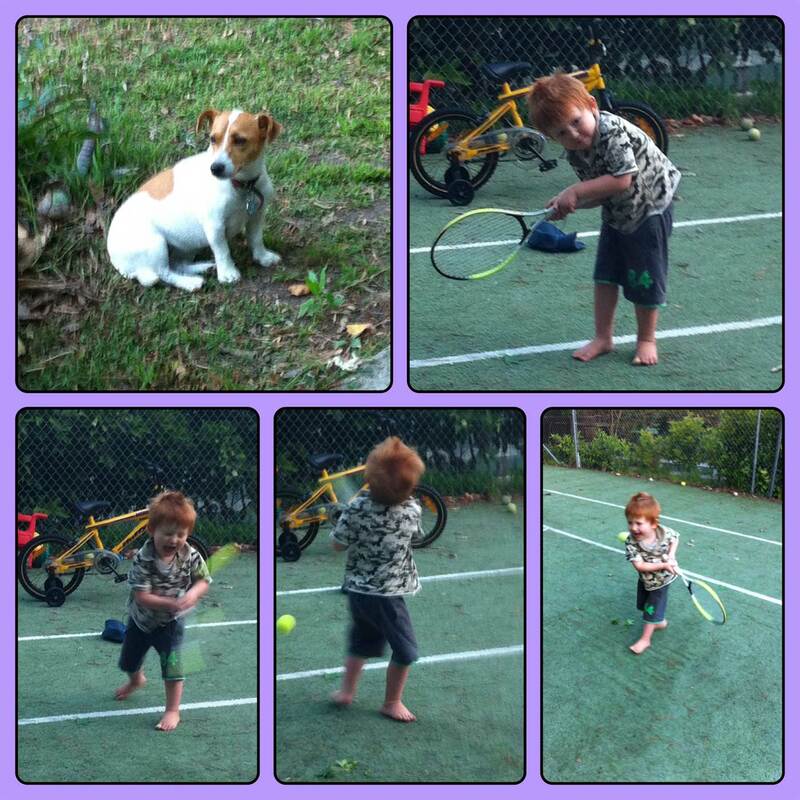 Do watch the little Jack Russell with snakes, they are notorious for finding them and killing them but sometimes the snake bites back as happened to our grand children's dog over $1000 later he was ok but never quite the same. Penny, yes, snakes and dogs are not a good combination. Peggy has already racked up quite a vet's bill with tick poisoning. A ukelele! I've been thinking of getting one (no idea where me old one ended up! )and I did, sort-of, promise to treat myself in the new year. So good to read your blog! I love the Euca photo - yes, such beauty in those trees! I'm glad you are now having a bit of rain. I trust your temps are a bit lower as well. I'm not a huge fan of snakes, but I would never hurt one, unless it was threatening to hurt me or my grand cherubs (thank you for lending me that name for my littlest ones!). Loved all of your photos...even the poor skeletonized leaves. Nature can be so harsh at times. Be well and enjoy your new ukelele. Love, love, love those photos of dear Eddie! Hello Judy, yes, aren't the eucs wonderful. Though in the wild and wet weather they scare us a little as we hope their roots are firmly in the ground and their branches are not planning to fall. I've been following the news reports on the fires and the floods in Australia, quite frightening. I'm glad you're ok and no wonder you need to blog about your extra-ordinary everyday experiences. I'm one of those persons that get freaked out by snakes but I'd never harm them. I'd just turn around and run! Ersi, the snakes are okay if they stay in their allotted part of the garden and we only move them if necessary. However I wouldn't willingly deal with the poisonous ones. I might run, too! oh what a pretty snake have never seen that species and grr re the Monolepta beetles, I remember them from when I lived up in Northern NSW, they can eat a tree over night! have have fun with the ukelele! The Monoleptas left us and the trees are recovering, thank goodness, though now they are dealing with way too much rain. 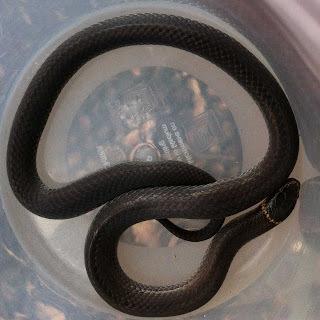 The little Krefft Dwarf Snake is very pretty , not that everyone agrees with us. So sad to hear all about the fires and floods--we have had both a flood and a house fire over the years and it is so devastating. Hope all of your loved ones are safe. As for snakes I scream at the sight of them---would never get close enough to hurt one for sure. 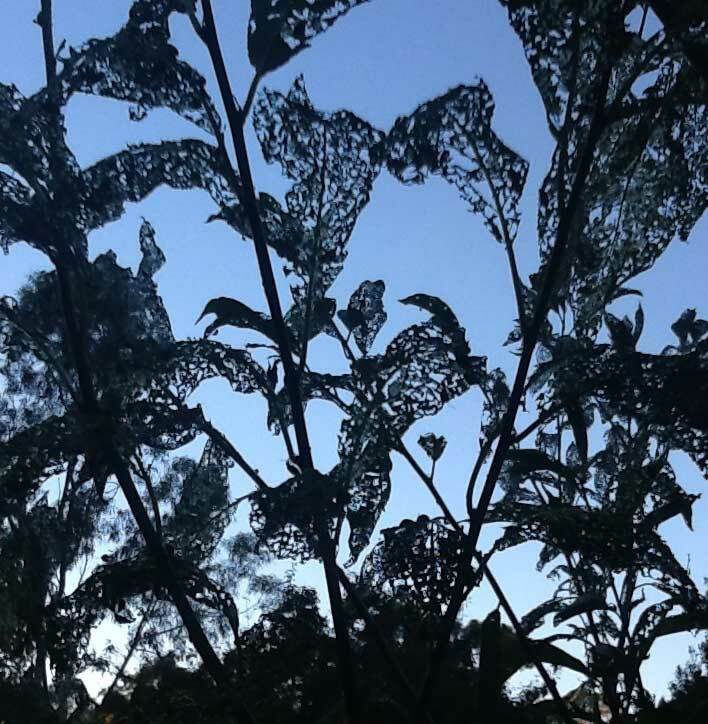 Loved the pics of the foilage in your garden. Hi CatieAn, a month later and we are still sodden and water logged. All my loved ones are safe, thank you. Amy, we are a world apart and I love to see your photos and share mine. We are safe, just very wet! Fire is scary. Thankfully its not something we typically worry about here in Ohio but we have family in San Diego and LA where there have been a number of fires over the years. Have fun with your ukelele and the dog. Hoping the snakes stay put and keep their distance. Kathryn, I haven't seen a snake since that little fellow. It is so wet they are probably keeping hidden. 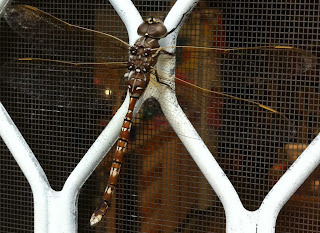 I love the stream of consciousness, also the gorgeous eucalypt and the dragonfly and the snake. I respect snakes - don't know any well enough to say if I like them. You seem to be getting the world's weather chamges to extreme. It's so shocking to hear about these things when over here we get a bit excited if there's a foot of water on the road. And fires like that we only get in extreme summers - though I suppose a truly raging one could deforest the whole island! Mig, lovely to have you visit. I so enjoy your blog and those wonderful boating pics. I think here today there is about a foot of water on the tennis court! And still bush fires in the west. Tough weather!